Movies: We’ve recently discovered Lilo & Stitch. A Disney cartoon that takes place in Kauai and includes an Elvis-impersonating extraterrestrial? Enough said. And have I mentioned that I’ve only been to the movies twice since my daughter’s birth in April 2012? It’s interesting how a former favorite activity no longer seems worthwhile since becoming a mom. Television: Marie and I have been enjoying The Magic School Bus. I also started watching the new season of Orange is the New Black, but had to stop, because apparently (despite NPR’s love affair with this show) I can’t handle watching shows that are rated M. I do recommend the book of the same name however. Piper Kerman’s memoir of her time in prison for a minor involvement in an international drug ring was an interesting read and gives important insight into the prison system. Music: Same old nursery rhyme remixes and classical. Work: School’s out for summer! I was lucky to have the opportunity to sub for an elementary school speech pathologist several times in the last few weeks of school. I found that I really enjoy working with kids one-on-one and in small groups. But I’m unlikely to make a career switch to speech pathology, as it would involve a year of prerequisite classes before starting a two year master’s program. I’m also currently in between paid writing projects. Recipe: We’ve been getting lots of kale in our CSA, but Marie won’t eat it, so I tried making kale chips for the first time yesterday. Success! She ate them and they were super easy to make. Gratitude: We went on our first family bike ride with Marie this morning in a pull-behind trailer. My parents were able to join us as well. Saw three great blue herons. Looking forward to many more bike rides this summer! 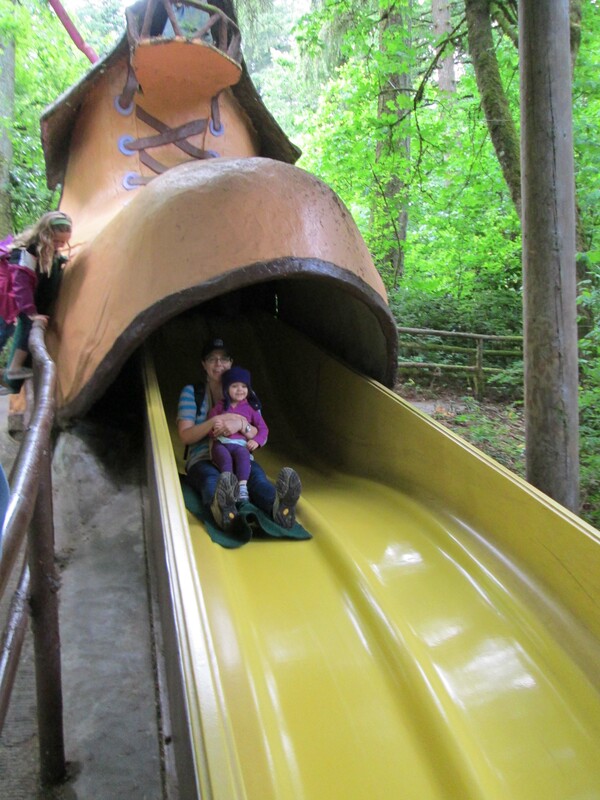 On the Old Woman Who Lived in a Shoe Slide on our first visit to the Enchanted Forest.